The storms of last evening--which were at times ferocious, have given way to a beautiful dawn with the birds singing and the breaking of a great looking day to start Memorial Day Weekend. We spent last evening with friends--after I arrived at the airport I went directly to have dinner and wine with our friends to start the weekend--I can't think of any better way to begin any weekend, let alone a holiday weekend. I am becoming a bit frustrated with Southwest Airlines though because it seems the on every flight lately they are securing the cabin for landing earlier and earlier--meaning I can't read my Kindle or play on my iPhone. I'm not sure it is really necessary. Last evening they secured the cabin a full 55 minutes before we actually landed--they said due to turbulence, but there wasn't any turbulence. And I am also noticing that the seat belt sign is staying on longer and longer--which means that people are beginning to ignore it more and more. But it is the weekend--the pool is ready, the lawns need to be mowed, there is mulch to spread, a dump run to make, and I am sure groceries to shop for. 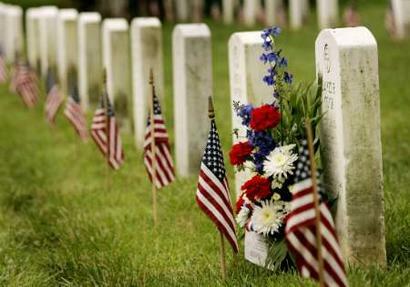 I would remind everyone that Memorial Day was a day to honor and remember those military men and women who died while in service to our country. It used to be called Decoration Day. And while the scope of the remembrances have grown, and the activities associated with the day which really also marks the beginning of the best season of the year--Summertime, the holiday is a day to remember those who we have lost and to celebrate their accomplishments. Last evening, as I was returning to Baltimore on the flight, the crew announced that there was an honored veteran of WW2 on the flight--and we all clapped and recognized his service. It was great the way the entire cabin of the aircraft took a moment to remember the accomplishments of this veteran while he was still alive. I am still haunted by an image I saw in the paper a few weeks ago of a small boy--4 years old I think, hanging onto his Dad's casket at the military funeral. He was saying good-bye in the only way he could. It was a touching image--and I could not find it, to share it. And so, I am reminded--there are lots of families in our country this weekend who are mourning the loss of sons and daughters, and husbands and wives, and brothers and sisters--and we need to keep them all in our prayers, for their sacrifice and the sacrifice of their loved one is far greater and more real than many of us can imagine as we stuff ourselves with hamburgers and beer from the grill around the swimming pool. Why are the Drawers Empty?